Megacity Cost Of Living -20 to 60 Times More! In most of Middle America, nice, new, comfortable, well-appointed houses sell every day for $80-to$250 per square foot. In an overcrowded, rat-infested, megacity like New York, real estate has sold recently for over $5,000 per square foot, which is 20-to-60 TIMES MORE THAN IS SUSTAINABLE FOR LONG (especially IF Global Warming floods NYC). Successful $100,000-per-year Middle-America executives have good reason to believe that if they move to NYC, they should be paid at least $2,000,000-to-$6,000,000 per year, just to break even. To accomplish this basic goal, they have no choice but to morph into extremely-greedy, selfish profiteers, with no concern for other people OR the well-being of Earth’s fragile environment. With the current negative trends of overpopulation and urbanization this is our legacy to our children. How do 22,000 Goldman Sachs employees make so very much money (so they can afford to live well in NYC)? On January 14, 2010, in front of the U.S. Senate hearing on financial industry fraud, Lloyd Blankfein (Goldman CEO) testified that his company sold $40 billion of high-risk mortgage-backed securities (based on misrepresentation of their quality and value) and then, knowing that they were likely to default, Goldman Sachs purchased instruments that resulted in profits for the greedy profiteering company when it became necessary to foreclose on the homes. In essence, they sold worthless securities to their clients, and successfully "BET" that their clients would lose money. When you walk down the over-crowded streets of a filthy megacity, you sense the powerful frustration, lack of concern for the environment and social injustice. You hear hundreds of angry people shouting obscenities. You can watch them step over the homeless, and turn red-faced when they try to hail a slow-moving cab in the constant traffic jams. Somehow they feel that making millions of dollars by ripping off humanity makes their life worthwhile. They have NO CLUE what Universal Consciousness is, and they most certainly do NOT live in Harmony with Nature. As population-and-urbanization trends accelerate worldwide, and corrupt megacity cost of living skyrockets even higher, is this the legacy we want to leave for the grandchildren we are raising today? Non-learning FOOLS think we should. MOST NYC professional jobs could be performed electronically from almost anywhere in the world, in a luxury $250-per-square-foot new home with a solar-heated indoor swimming pool (like our own 5,000-square-foot Zero Energy Home was in 1979). IF the NASA scientists who sent men to the moon are correct, NYC drops below sea level, and the lights go out on Wall Street in the 21ST Century, can we rapidly build ecologically-sound, sustainable new large cities, with the highest standard of living the world has ever seen, relatively-low initial capital investment, and extremely-low ongoing operating costs? Wouldn’t it be reasonable for us to build the FIRST Eco-City holistically-integrated prototype TODAY, to work out all of the details BEFORE scaling it up to multiple locations in only a few short years? Zero Energy Design has the specific Emerald Eco-City plan to do precisely that. Multi-million-dollar NYC salaries make ANY company non-competitive in the more-efficient international marketplace. IF an over-compensated greedy executive takes on way-too-much risk (while trying to fulfill personal gluttonous goals), the executive’s company will most-likely fail (as did Lehman Brothers in September 2008, triggering global collapse). 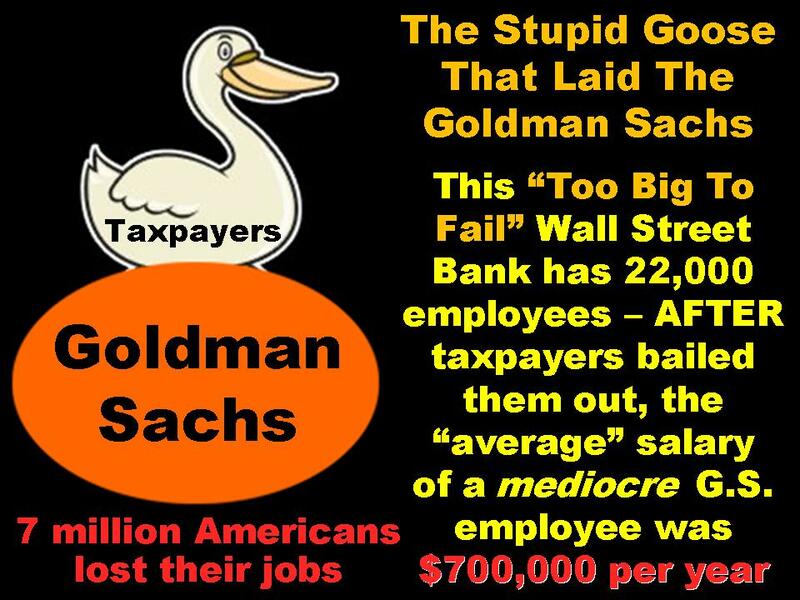 If our misguided government erroneously believes that a toxic company is “Too Big To Fail”, and uses TAXPAYER FUNDS to bail the company out with billions of dollars, THEN essentially, the company executives should be treated as government employees (with poor performance ratings). GS15 public-servant government employees reasonably make less than $128,000 per year. Why should the bad executives of failed banks and automobile companies that we bail out be paid much-more than a GS15 with a HIGH performance rating? Why should bailed-out-company evil executives with demonstrated POOR Risk Management skills be compensated FORTY TIMES MORE than the elected President of the United States? The ONLY reason is corrupt, conservative, conventional, arrogant, narcissistic, egotistical business-as-usual thinking. In a democracy, the Middle America Majority can no longer tolerate such unsustainable wealth-robbing behavior ever again. Those who want to perpetuate the problems of the past that THEY created are in for a rude awakening VERY SOON. (Do you remember stories about the French Revolution?) The way that greedy executives have decimated the American middle class WILL soon have serious consequences. We must radically reinvent society, including much-lower sustainable cost of living than megacities have today. “As our case is new, so we must think anew, and act anew. How much will Emerald Eco-City cost? The flippant obvious answer is “It depends.” But seriously, are there any recent examples of anything remotely similar? Real-estate estimators and appraisers must have “comparables” that they can use to compare the differences. 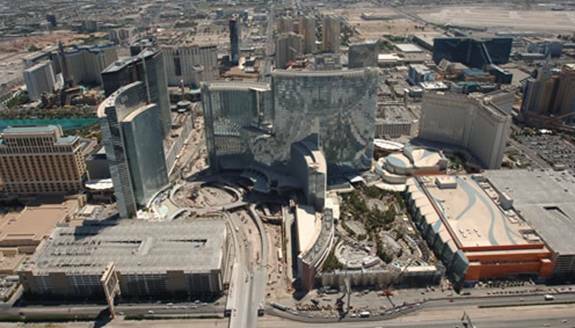 The mammoth Las Vegas “CityCenter” project is a complete 16.8-million-square-foot Sin City community, built (badly) as a single construction project. The original (reasonable) cost estimate for investors was $4 billion ($238 per square foot). 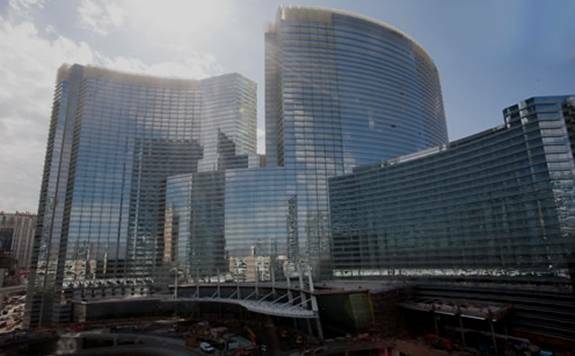 Due to terrible Architecture and construction mismanagement, the final cost will actually be about $11 billion ($655 per square foot, or more). Primary-investor lawsuits were filed and have now been settled to allow final project completion. We PREFER to build Emerald Eco-City on nearly-free U.S. desert southwest land, with NO existing infrastructure whatsoever. It is much-more cost-effective to build our NEVER BURN ANYTHING self-sustaining Eco-City correctly from the ground up, than to try to work around the bad American city assumption that petroleum-powered SUV’s are the most-important center of all design decisions. The high-speed all-electric Emerald Eco-City 3D advanced-technology internal transportation system will require about one fiftieth (1 / 50) of the area required for the much-more-crowded, slow-and-inefficient, frustrating New York 3D transit facilities. We will have “free” high-speed 3D transit and robot messengers to rapidly move people and products anywhere within the city in a matter of minutes, with an elevator-like push of a button. (No irritating cab drivers stuck in traffic jams.) Order today’s fresh-picked food online, and it shows up in your kitchen from anywhere in Eco-City, in only a few minutes. Compare the exterior surface area of the many CityCenter buildings, with the surface area of the adjacent skyscrapers in NYC. Although NYC grew haphazardly over centuries, and CityCenter was built all-at-once as a single-design-and-construction project, BOTH terribly-inefficient cities have isolated, stand-alone, non-consolidated, non-integrated, arrogantly-mis-conceived, EGOCITY Buildings. Each building has a huge surface area exposed to the annual climatic condition extremes, which necessitates huge air conditioning systems with high initial cost, and even-higher ongoing operating costs that badly contribute to Global Warming Greenhouse Gas, AND Urban Heat Islands. Both NYC and CityCenter are covered with a high-percentage of indiscriminate expensive glass on all sides of buildings with a high-surface-area-to-usable-space ratio. You look out your NYC window (if you are lucky enough to have one) at someone in the adjacent building looking back at you – Both of you sadly wishing you were somewhere else. In contrast, Emerald Eco-City is Totally Integrated, Consolidated, and Optimized in Three Dimensions. It will have less than 1/100TH of the exterior surface area of NYC or CityCenter buildings in total. Every living area and office space will have sunny views of Green Nature. Integrate “ZED virtual windows” will bring dramatic view of anywhere in the world into every interior room. The complete Emerald Eco-City construction will cost FAR LESS PER SQUARE FOOT, including some of the most-luxurious integrated amenities in the world. Our Eco-City will be totally self sufficient, with Zero Waste, No Landfill, and much-lower-cost of internally-grown local picked-fresh-today organic food. Dirt-floor central park solarium greenhouses with southern high-emissivity glass walls are extremely-low-cost square footage, that brings daylight and Nature views into almost every interior room. The endless Emerald Eco-City cost-of-living reduction opportunities are unprecedented in human history. Why should humans EVER settle for business-as-usual overly-expensive gross-inefficiency, when we NOW have the motivation, technology, and capability for Abundant Luxury Living In HARMONY With Nature. Emerald Eco-City will be the world’s-largest human construction project ever – A massively-collaborative holistic system integration-and-optimization demonstration that will set the new standard of environmental excellence for over a century, and share technology with the moon and mars colonies (IF humanity does not complete its own suicidal annihilation first). Our only real choice left today is self-imposed death by greedy unsustainable business-as-usual, or Emerald Eco-City. Which do you chose for YOUR grandchildren? You cannot avoid picking one or the other RIGHT NOW. Read on if you seek the specific details of HOW. Don’t just talk the talk – Let’s begin to walk the walk TOGETHER. Copyright 1979 – 2011 Larry Hartweg www.ZeroEnergyDesign.com All international rights reserved - No reproduction in any form without explicit permission This Site developed by Rose Meyer Hartweg.